Sen. Frank Lautenberg (D), the 89-year-old senior senator from New Jersey, might be declining to run for re-election in 2014 because he’ll be 91 at the time.Or it could be he announced his pending retirement late Thursday because the polls suggest he would lose a costly Democratic primary fight to popular, almost super-heroic Newark Mayor Cory Booker. In December, Booker said he was “considering” running for the seat, fueling speculation and raising the ire of Lautenberg and other New Jersey Democrats. But at this point, Booker is looking like a pretty good bet. A Monmouth University Polling Institute survey released Thursday, before Lautenberg’s announcement, showed Booker trouncing all rivals for the 2014 race, garnering 40 per cent support to 25 per cent for Lautenberg and single digits for every other Democrat. As for Republicans, the only one who’s speculatively thrown his hat in the ring is Geraldo Rivera. 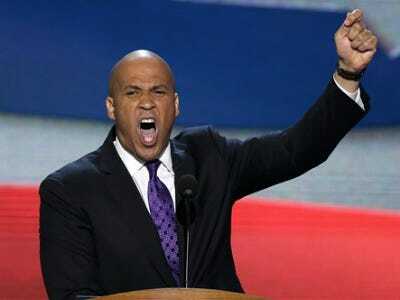 With Lautenberg out, Booker is “the favourite to succeed him as senator,” says Aaron Blake at The Washington Post. “But Booker is unlikely to get a free ride.” A handful of other Democrats have expressed interest in the rare open Senate seat, but just one, Rep. Frank Pallone, is expected to give Booker a real run for his money. The same Monmouth University poll that has Booker the prohibitive favourite also shows that 31 per cent of Garden State Democratic primary voters say they want a competitive race, even while 38 per cent say they want the party to line up behind Booker. “It’s not that he’s not the likely senator, but he’s not the presumptive senator,” a Democrat close to Pallone tells The Post. The biggest obstacle for Booker may be New Jersey’s Democratic machine. “To receive a party’s nomination in New Jersey, a candidate needs to get the endorsement, known as the party ‘line,’ of most of the county party leaders in the state,” explain Alexandra Jaffe and Cameron Joseph at The Hill. “That line gives the candidate preferable treatment on the ballot, and almost always leads to a win in the county.” And Pallone, who’s been in state politics since the 1980s, has much stronger ties to local Democratic power-brokers than Booker. One thing’s for certain, says David Nir at Daily Kos: Senate seats don’t open up very often in New Jersey, “so we can expect a pretty intense contest,” even if it’s just between the 43-year-old Booker and 61-year-old Pallone.